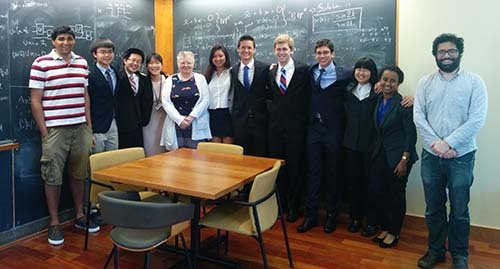 Since 1996, MIT has hosted a six-week summer program for high school students who are chosen for their superior achievement in math, science and engineering. Seventy-five high school juniors are selected by the Research Science Institute (RSI) based in Washington DC. RSI is part of the Center for Excellence in Education, a federally and privately funded nonprofit organization. There are about 3,000 applicants to the program each year and of the 75 selected, about one third are from abroad and two thirds from the United States. About a dozen students are selected to work on research projects in mathematics. The MIT Mathematics Department Faculty Advisors for RSI, Professor Davesh Maulik and Professor Ankur Moitra, match each student with a mathematics graduate student mentor with compatible interests. The graduate student mentor devises a research project, often in consultation with an MIT faculty advisor. The graduate student then meets with each of his/her mentees each weekday during the RSI program. Dr. Slava Gerovitch is the program director. The application materials and the process can be found online at CEE RSI application page . At the end of the program, students make presentations to each other and to a panel of scientists who are usually former RSI participants themselves. See abstracts and papers from recent mathematics projects. RSI students often use their projects to participate in the Intel Science Talent Search (Intel STS) and the Siemens Competition in Math, Science and Technology or the Intel International Science and Engineering Fair (Intel ISEF). The mathematics group has been very well represented among the winners of these contests.